Today is Mother’s Day and it is a chance to reflect on how important mothers are in our world today. They provide unconditional love and support to their children and are the glue that holds families together. 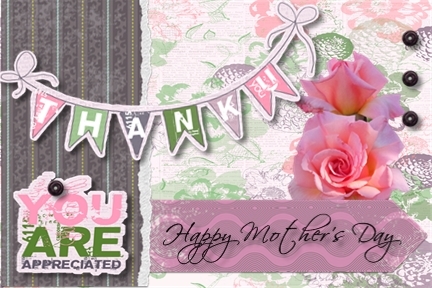 I have created this card for all the mothers in the world. I have used the 2013 Anniversary Digital Kit and used the colour coordination feature to change the colours from blue/green to my favourite pink. I hope you enjoy my offering. Thank you Amanda. I wonder why the days are so different – our Father’s Day is in September as well. Never mind, at least we still get acknowledgement for all the good we do in this world. You have a great day.